Bearing the very clever headline, “Chicanery Row,” entertainingly and sagely written by Shawn Macomber, it can be found here. The first known plug for “DS” was by Reason mag’s Nick Gillespie, who kindly named it his favorite book of 2012 — and my ebook was only out for three weeks of the year. My marketing and promotion director, Bill Steigerwald, has been bombarding the book people at the New York Times, L.A. Times, Wall Street Journal and the Washington Post with emails, trying to get their attention, if not a book review. It’s not easy. But maybe the Standard has lit the spark. Meanwhile, in the Big Apple, the blog site GalleyCat, aka “The First Word on the Publishing Industry,” blurbed a “DS” blurb on Friday, finally succumbing to a barrage of promo pitches from me. 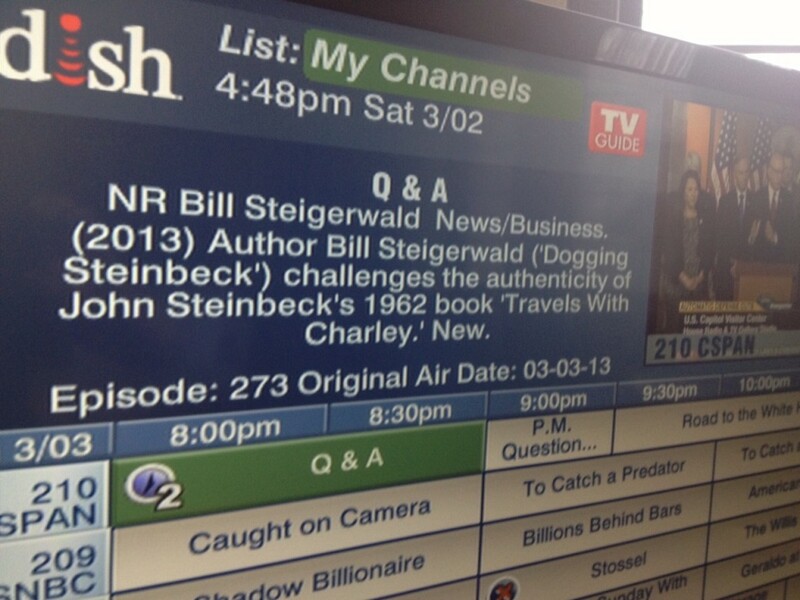 And look for Paul Theroux’s mention of me and “Dogging Steinbeck” in his New York Times travel piece on Sunday Jan. 13. Self-publishing is hard work, but maybe I’m getting somewhere. Forty-four years after his death, America’s most widely read author is taking some lumps. First I proved his 1962 “nonfiction” book “Travels With Charley” was a literary fraud filled with fiction and lies. Now the Nobel prize people in Sweden have opened their archives and Steinbeck’s reputation has taken another hit. It turns out Steinbeck, who had been nominated eight times before for the Noble Prize for literature, was a compromise choice for the award in 1962 and he only won because the competition was so weak. Steinbeck didn’t get much respect from the critics in his later years. Everyone but him wanted him to write “The Grapes of Wrath” over and over. Even when he won the Nobel Prize for Literature on Oct. 25, 1962, the literary mafia at the New York Times and Time magazine quickly dissed him, saying he didn’t really deserve it because he hadn’t written anything of value in decades. Meanwhile, there’s a “Travels With Charley” connection to Steinbeck’s Nobel. As part of its decision, the Nobel selection committee took into account the roaring success of “Charley” in the late summer and fall of 1962. When Steinbeck was given the prize in Stockholm, here is what the presentation speech said about “Travels With Charley,” the supposedly nonfiction account of his 1960 road trip that had hit No. 1 on the New York Times bestselling nonfiction list on Oct. 21, 1962. Of course, nearly everything the committee assumed was true about Steinbeck’s road trip and his book was not true.